This post goes out to all those good things which existed in the 90s. Most of them were and still are completely unknown to anyone because they were buried in a sea of garbage that is usually associated with that era (by me anyway). Rarely does anyone even go back to that time period even as a result, unless it is for cartoon show themes. But let me tell you, there are some things from the 90s which stand out like shining jewels among the debris, and I am proud to present one to you tonight. The Olivia Tremor Control is definitely up there in my top 5 in terms of bands. Part of the Elephant Six Collaborative and hailing from Athens Georgia, the band is the most perfect form of psychedelic rock. They basically sound as if the Beatles had never stopped making music, and this was just actually where they were in the 90s. The album which I will be sharing is called Music from the unrealized film script: Dusk at Cubist Castle. It was released in 1996 and was sadly swept away in the unfortunate river of boy bands, rap, and other nonsense. But I have managed to fish it out (I proudly own the CD), and will write a few words about it. The first song on the album is “The Opera House”. A barely inaudible vocal loop flies by quickly and a raw guitar starts playing its hard rock line. Don’t forget to notice the bizarre assortment of horns coming in from all angles. “We feel OK, which is how we feel most of the time now” The lyrics are only going to get trippier from this point on in the album and I feel like this song is very good warm up. “Jumping Fences”: This title alone speaks on a more psychedelic level. Another almost downright silly guitar intro is quickly forgotten as the rhythm joins the party, especially that suave bass line. The lyrics in this song have got to be some of my favorite ever. “We both know that this world made no sense, when you jumped everybody’s fence.” I feel like you either understand what this line means or you don’t, and it all depends on your experience with magic. This song at a little under 2 minutes is a quick, rocking display of why this band sounds like the Beatles. If you don’t hear the similarity then you may have never heard the Beatles. And don’t think that I’m saying that they are ripping the Beatles off. 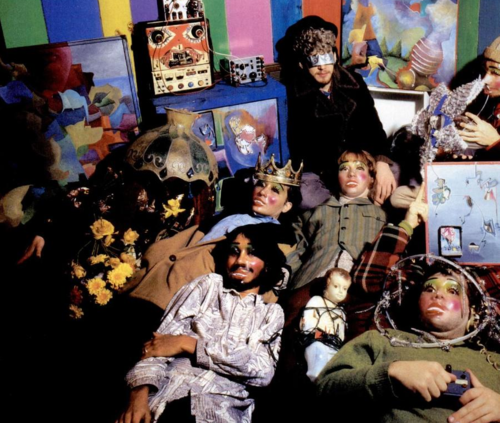 The Olivia Tremor Control has definitely contributed more to this genre of psychedelic rock than almost any other band, they just had the misfortune of picking the 90s. I really am not sure which song off this album is my favorite, but there definitely are times when I believe that song to be “Holiday Surprise 1, 2, 3”. This song starts out slow and easy, almost with a country vibe. I’d like you to notice the vocal layering which this band uses, because that is what gives these songs that darker edge. Specifically the lines “Don’t Worry” and “In a dream” employ this and definitely to great effect. “Courtyard” can be best described as a haphazard song. The melody is wonky and rhythm is simple,the piano is just downright ridiculous, and yet it contains some of my favorite lines ever. “Going back to where you are, and there’s nothing that I can’t tell you that you don’t already know.” I still can’t accurately tell what it means. Also a short song, it is the kind that puts a smile on your face whatever the situation. It’s simple and fun. The Olivia Tremor is rumored to have reunited to create a new album, which makes me very happy. This band deserves a lot more recognition then it currently has. Almost no one makes such well thought out and all around trippy music they use. If you are lucky enough to own a CD or Record of theirs, then you will be rewarded by being able to actually notice all the different layers each and every song contains. Seriously, there could be up to 12 sounds playing at once at any given time during a song, and mp3’s will never be able to do that justice. The more stuff happening at once, the tripper, am I right? You just have to learn how to pry out the gems. Listen to this band, because bands like Korn definitely did not deserve the fame.